We invited four influential designers and tastemakers to interpret this season's key interior trends using fabrics from our fabulous new Roller blinds collection. Discover more about the stylists, the inspiration behind their designs and their top tips for getting these fashion-forward looks in your home. One room, four styles designed by this year's handpicked stylists. Explore the story behind each style and the fabrics that make them. Roller blinds have got their groove on. 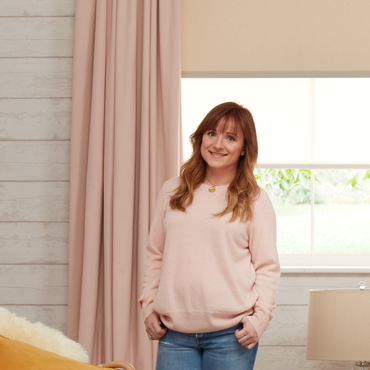 And to prove that Roller blinds are right up there in the style stakes we invited four influential designers and tastemakers to interpret this season’s key interior themes using fabrics from our fabulous new Roller blinds collection. Claudia is a freelance journalist, writing design and interiors features for a broad range of influential interiors publications, including Elle Decoration, Livingetc and Sunday Times Style. Erica Davies is a stylist, fashion journalist and brand consultant with over 15 years’ experience as a fashion director for national newspapers and magazines. She is also the author of influential style blog The Edited. Emily Murray is a former lifestyle journalist and author of ‘The Pink House’ blog. The focus of her blog is taking interiors inspiration and advice from fabulous people and places and using it to make your place amazing. Jordan Cluroe and Russell Whitehead are London based actors turned interior designers, who set up 2LG studio in 2015 shortly after Jordan appeared in BBC2’s The Great Interior Design Challenge. To showcase the stylish and versatile designs in our new Roller blind collection, four influential interior stylists and tastemakers have each designed a bedroom using fabrics from the collection. These distinctive designs each reflect a key interior trend for spring and summer, and whether you love the simplicity and relaxed charm of Modern Rustic, or you’re drawn to the dark elegance of Urban Glamour, you’re sure to find lots of design inspiration for your home. But there’s more to our Roller blinds than style alone. With a range of performance fabrics, including blackout and moisture-resistant options, you can get creative in every room in the home. And to give you even more design choices, our interior stylists have come up with some great ideas for controlling light by combining sheer and textured Roller blinds, and for adding texture, pattern and extra cosiness by layering Roller blinds with curtains or Roman blinds. Request an in-home appointment with one of our expert advisors and we’ll bring our entire range for you to browse at leisure. As well as a huge range of styles, colours and performance fabrics, you can also choose from a stylish range of pulls, hem shapes and decorative poles. And of course, we’ll measure up and return to fit your made-to-measure Roller blinds so you can enjoy a dream look of your own.